Seems too complicated? You don’t know where to start? Don’t worry, “Sing Me In” is here to guide you! 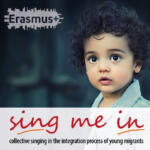 The partners of the project will present the free Handbook “Sing Me in: Including young people with migrant backgrounds in existing choirs”. This handbook was written for conductors and vocal leaders who want to welcome singers with migration background in their existing choirs and ensembles. Packed with practical information, methodological resources and repertoire ideas gathered to support the development of successful local initiatives across Europe, the handbooks will be available online in 11 languages.